I just returned from a quick trip to Vienna. The Christmas markets were in full bloom, lights, action-people. This time of year it is very popular to enjoy the warmed mulled-spiced wines that are in every market. And, I did so indulge. I actually thinnk my favorite was the warm Aprol spritz. Not to mention all of the beer choices. But, while there I was able to enjoy a few nice meals. (Though I actualy prefer the light snacks you can pick up from the street vendors.) Most restaurants will offer a variety of wines on the menu from vhianti to california cabernet and bordeaux. But if you really want to put a smile on the face of your waiter-order a local wine. I enjoy Gruner Veltliners and some dornfelders too. Tonight I am talking about Gruners. Specifically Winzer Krems Gruner Veltliner. 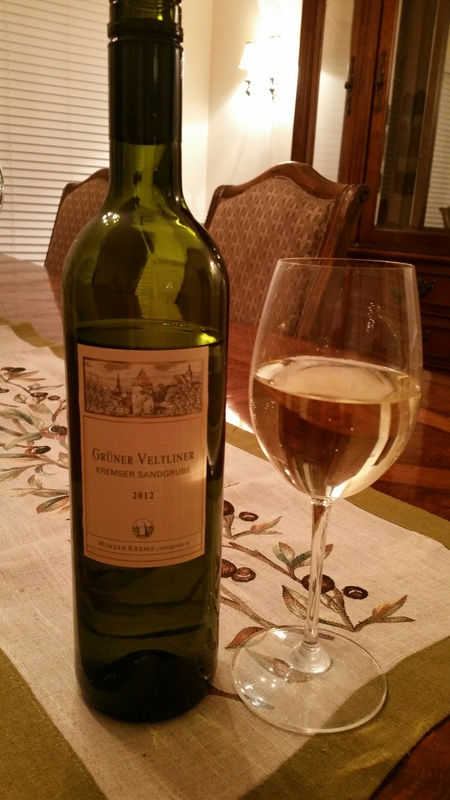 Gruner Veltliner is a type of white grape. Austria is best known for sweeter wines, but these are dry with a note of minerality. Think Chardonnay with a little more citrus. A tangy, fresh and crisp wine. The Winzer Krems has all of the above mentioned notes. The nose is soft with delicate hints of green apple, lime and yes it is almost like descibing not quite ripe pineapple. That sounds wierd but actually works well. These wines are little known in the US, but well worth a try. I know the season is a little late for white wines (If you follow this idea), but if you are looking for a little lighter wine to go with a light meal, you must give this a try. And, a very affordble wine at that. Prev Post: Hiho, Hiho, Anakena Pinot Noir-Tama Vineyard.